I don’t think many would’ve predicted at that Rosamund Pike and Givenchy would’ve been such a perfect union, but the duo were still going strong at the 2018 Governors Awards held in Hollywood, California on Sunday (November 18). 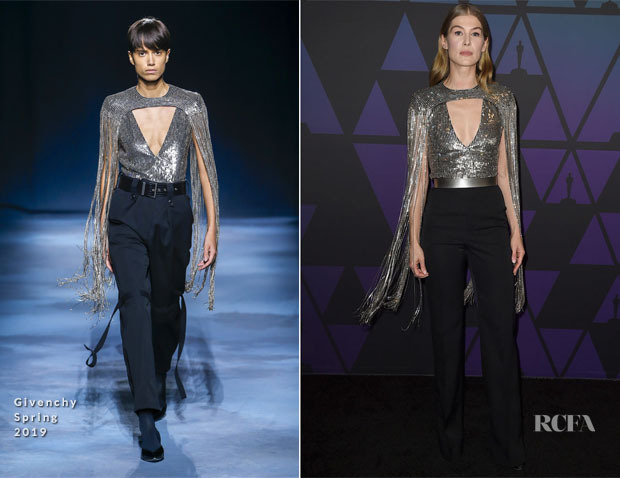 This time the British actress wore a look from the Spring 2019 collection. As with previous looks, the tailored options are really working well for her. On this occasion I’m glad that her trousers were more fitted and less baggy and less complicated than the pair which took to the runway. Rosamund’s look was oozing with refinement, which we expect, and I’m delighted she didn’t dial down the look by removing the fringed cape.